So far my visit to Queensland has been wonderful. I’ve certainly been enjoying the sunshine and the early morning walks with my dad along the beachfront or through the mangroves. Mum and I have found a few charity / Op Shop treasures including a plant stand for the herbs I will be buying for her at Bunnings. We also increased her Fairy / Angel / Cat collection by three figurines (Dad is thrilled….). We used this recipe from the brilliant taste.com.au website and highly recommend it. Combine lamb, onion, garlic, coriander, spices, oil and 1-teaspoon salt in a bowl. Cover and refrigerate overnight. Preheat oven to 160C. Heat a non-stick frying pan, add lamb in batches and fry until lightly browned all over. 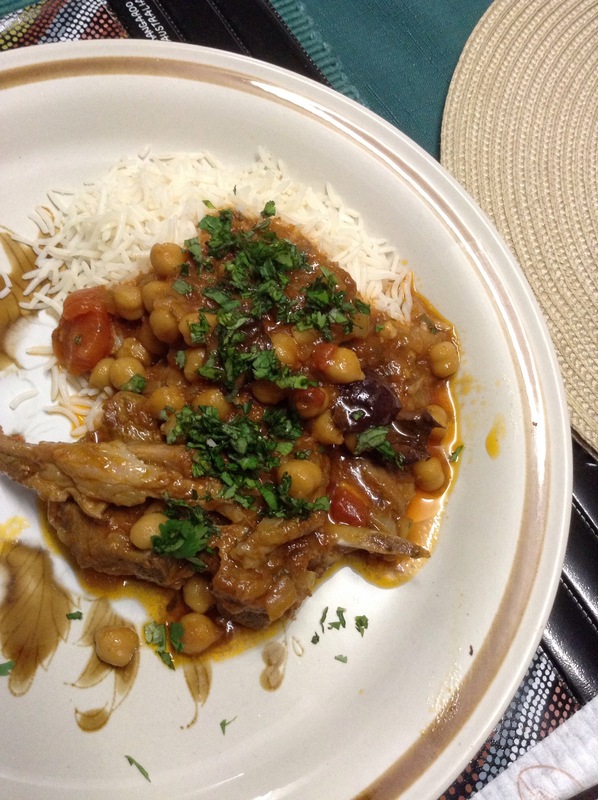 As meat is cooked, place in a tagine or casserole dish. Add orange peel. Drain tomatoes, reserving juice. Set tomatoes aside. Combine juice with tomato paste, then add to meat with stock and bay leaf. Cover and cook in oven for 1.5 hours. Use a slotted spoon to transfer meat to a plate. Place dish over high heat ( if using a tagine you will need to transfer the liquid to a frying pan). Add diced tomatoes and butter and reduce for 2-minutes, then add honey, chick peas, olives and meat. Cook, stirring for 1-2 minutes. Garnish with mint. 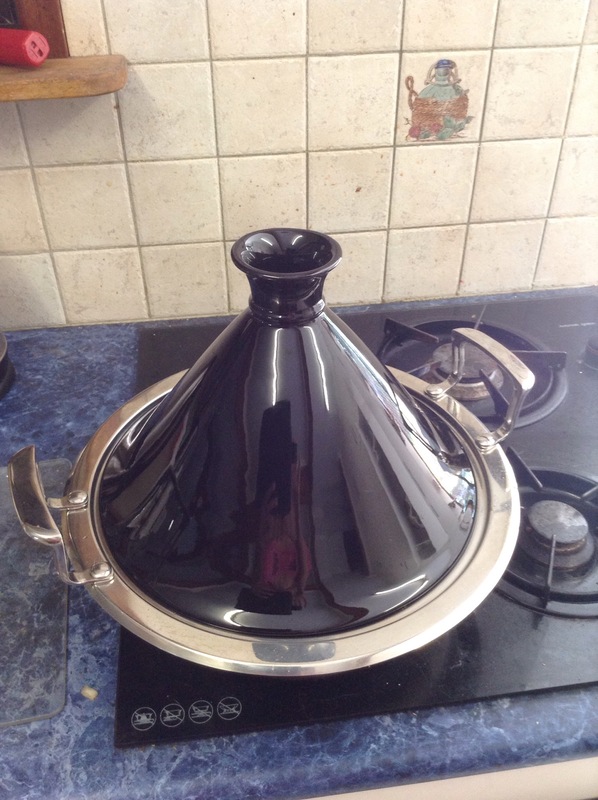 My parents have a tagine with a stainless steel base, which made the whole process even easier as we didn’t have to worry about transferring the liquid and we were able to cook it on the hob rather than in the oven. The leftovers were great on mashed potatoes! It’s fair to say that 2014 has not been the best year of my life, although I am currently enjoying a 6-week stint with my parents in Mackay, Australia – so things have certainly taken a turn for the better. They paid for my ticket to Sydney, hotel room and then flight to Mackay plus they have kept me in Tim Tams and Negronis since my arrival a week ago. 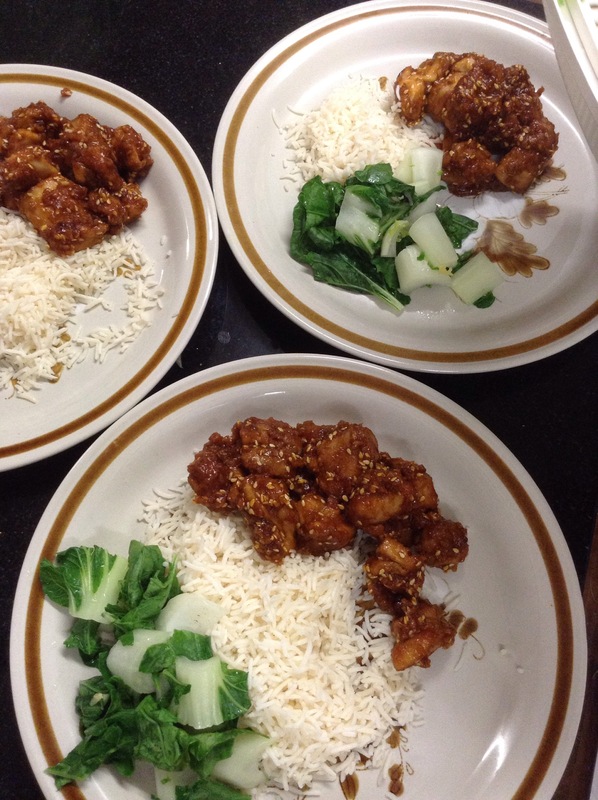 It felt only fair that I cook them special dinner to say thank you – so I pulled out one of my all time favourites – Honey Sesame Chicken. This dish gives combines the naughtiness of a Chinese take away with the healthfulness of being able to control the ingredients. It is tasty, decadent and according to my dad an absolute triumph. I highly recommend this super easy recipe from Shelby Law Ruttan. Simply put this is one of the best recipes ever! 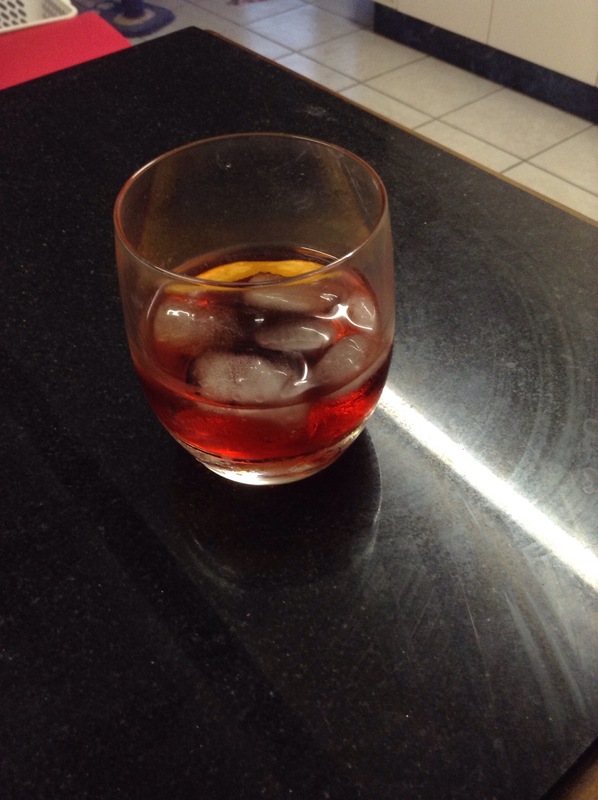 A negroni for the chef! One of my all-time favourite poems is ‘Chicken Soup With Rice‘ by the marvelous Maurice Sendak. I had this book when I was a child and I remember feeling cosy and warm as I read it under the blankets with a flashlight. Sadly it was not amongst my childhood books that had been kept in a Canadian storage container for the past 15+ years. It was most likely sold at a garage sale…or maybe it was lost during one of our many house moves. In any case I still love the poem and am delighted to see the book is still available to purchase….it is currently on my Amazon wish list. 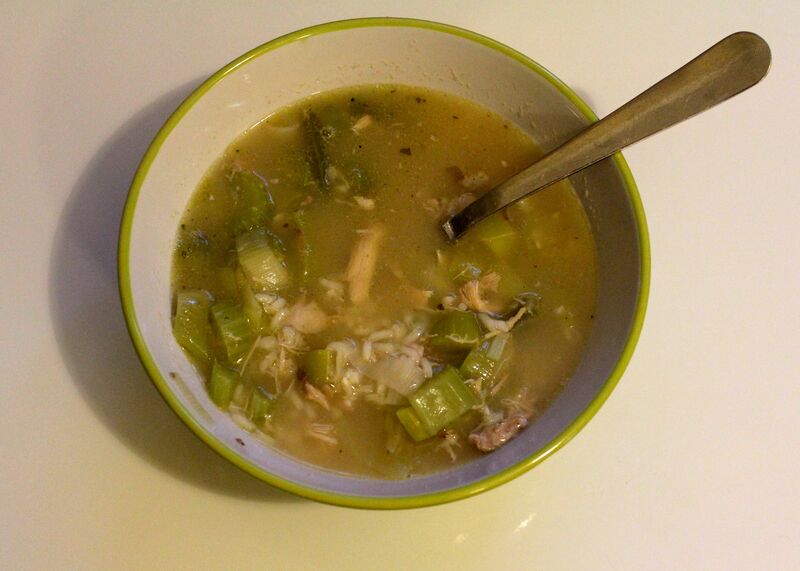 One of my all-time favourite soups is chicken soup with rice. It has been cold and very wet here in the UK this winter (surprise surprise!) and I decided a large bowl of chicken and rice soup was exactly what was needed in order to bring the feeling back into my numb fingers and toes as well as warm my belly! The day before we had a roast chicken dinner, so the chicken carcass was ready to be boiled into a hearty stock. This soup is really simple to make and you can play around with what vegetables, herbs and spices you want to add. I was clearing the fridge so used what I had. Oh and for those of you unfamiliar with Maurice Sendak’s poem I have included it below – read and enjoy…preferably with a large, steaming bowl of chicken soup with rice. Now here the comes the messy part…. I sift through the mesh strainer and pick out all the meaty chicken bits, including the skin. I also keep an eye out for small bones and tough gristly bits which I discard. Keep the chicken pieces to one side, separate from the stock, and get ready to make some fantastic soup! Enjoy it once! Enjoy it twice! Enjoy your chicken soup with rice! Slipping once, sipping twice, sipping chicken soup with rice. Happy once, happy twice, happy chicken soup with rice. In March the wind blows down the door and spill my soup upon the floor. Blowing once, blowing twice, blowing chicken soup with rice. And dream about hot soup all day. Oh my once, oh my twice, oh my chicken soup with rice. Mix it once, mix it twice, mix that chicken soup with rice. In June I saw a charming group of roses all begin to droop. I pepped them up with chicken soup! Sprinkle once, sprinkle twice, sprinkle chicken soup with rice. Selling once, selling twice, selling chicken soup with rice. In August it will be so hot, I will become a cooking pot. Cooking soup of course. Why not? 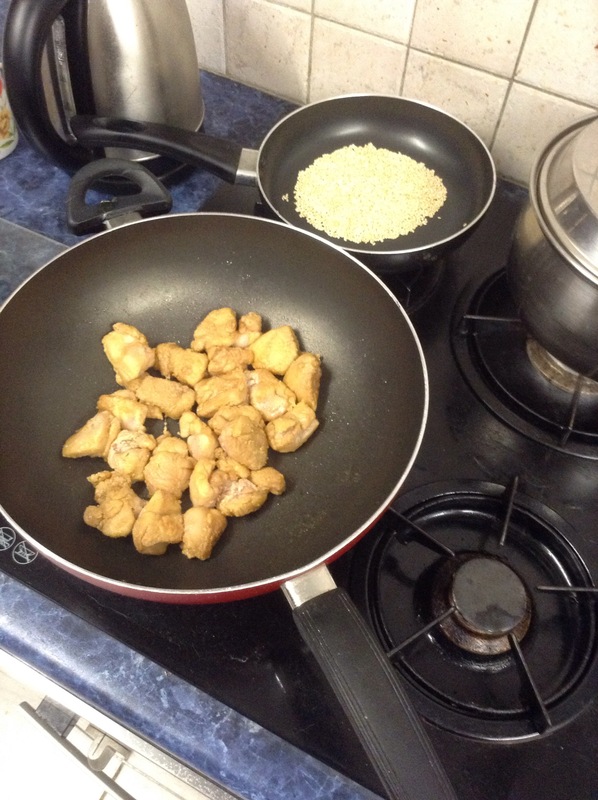 Cooking once, cooking twice, cooking chicken soup with rice. In October I’ll be host to witches, goblins, and a ghost. I’ll serve them chicken soup on toast. Whoopy once, whoopy twice, whoopy chicken soup with rice. And spout hot soup. I’ll be a whale! Spouting once, spouting twice, spouting chicken soup with rice. Merry once, merry twice, merry chicken soup with rice. Merry chicken soup with merry chicken soup with merry chicken soup with rice. I told you once, I told you twice all seasons of the year are nice for eating chicken soup, eating chicken soup with rice! There had been grumblings in weather reports over the past week that more snow was on the way. I chose to ignore the warnings and looked optimistically toward spring. It wasn’t unreasonable, I mean the sun did make a brief appearance a few days ago and crocuses, daffodils and hyacinths were beginning to poke their heads up in my garden. So imagine my surprise (aka horror) when I looked out of the bedroom window yesterday morning only to be greeted by several inches of snow. 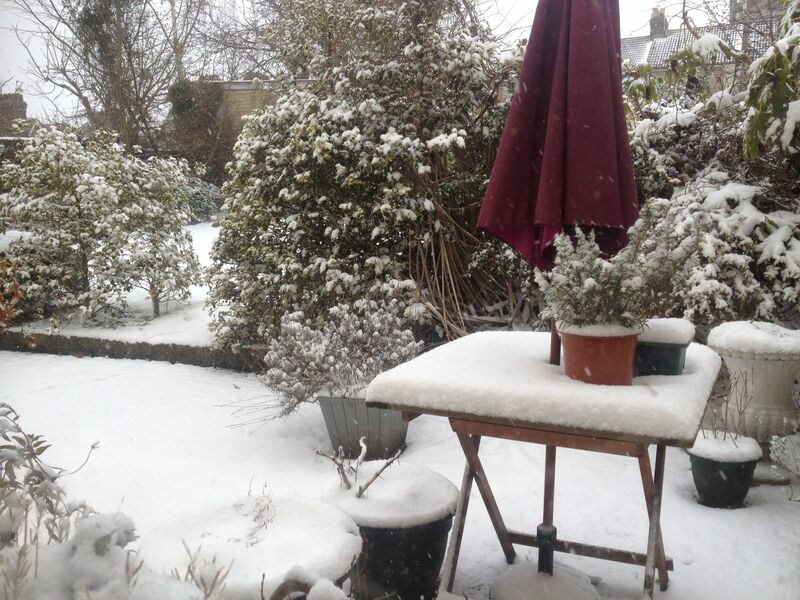 My husband was ecstatic as he had a ‘snow day’ (I could almost hear the sound of teachers and students all around the UK jumping up and down with joy – parents and spouses….not so much). It seemed appropriate then that I make a warming breakfast we could eat leisurely while watching daytime T.V. Bring on Homes Under the Hammer, Judge Judy and an unseen Columbo starring Robert Conrad (that definitely made me jump up and down with joy)! 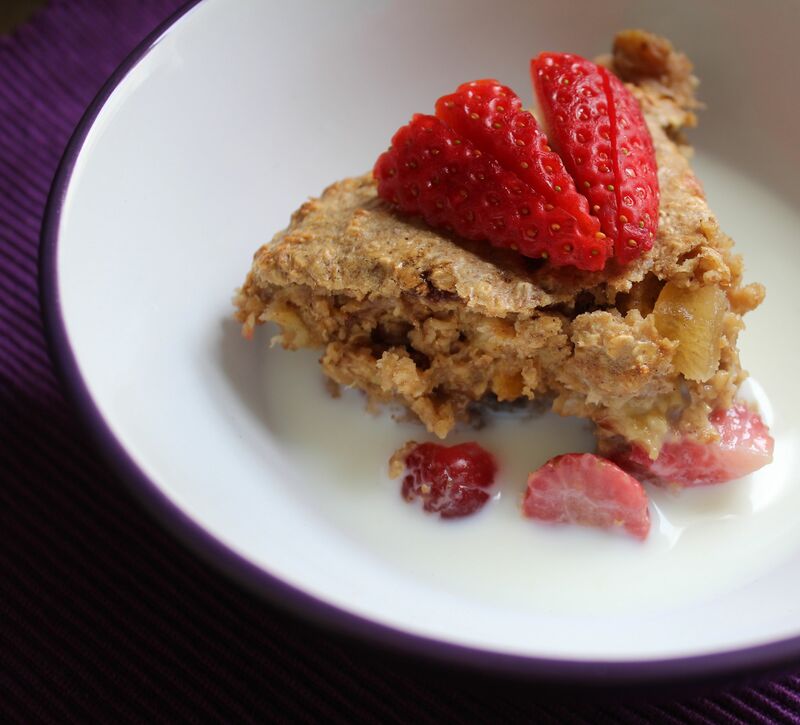 This recipe for Baked Strawberry Oatmeal on the GE Healthahead website caught my eye awhile back. A snow day in March seemed liked the perfect time to try it out. Not only was it really easy to make but it tasted fantastic. I will be making this again! We had some leftover which we had this morning for breakfast with warm milk. Yummy! Stir in remaining ingredients and pour into prepared dish. I usually work on Saturday but fortunately I don’t start until the afternoon. That means I have just enough time to watch Saturday Morning Kitchen and the lovely James Martin. A few weeks ago he prepared this dish. Instantly I knew what we would be having for dinner that night. In fact we love this so much we have had it every week since. It is warm and comforting – perfect for these cold, blustery winter nights. 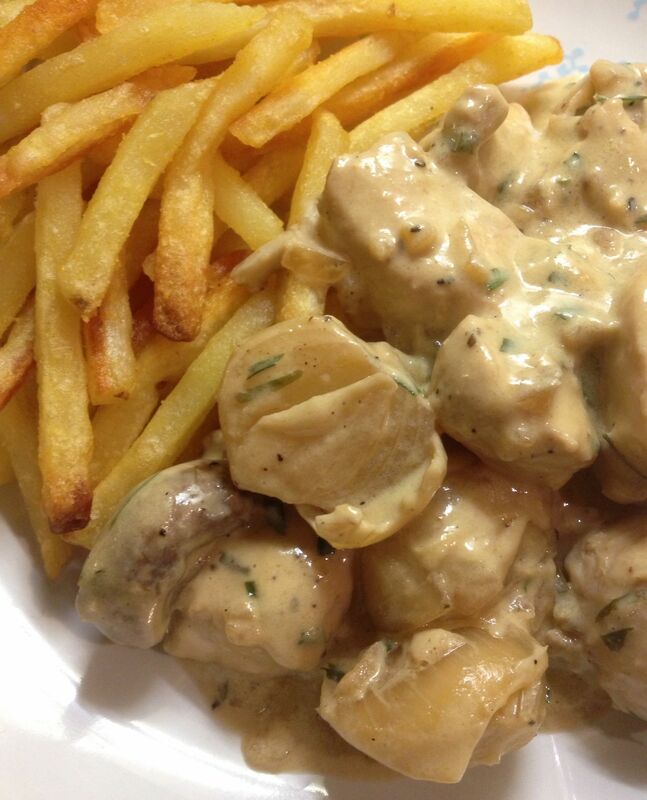 It also has a few of my favourite ingredients in it: Mushrooms, Chicken, Cream, and Tarragon! What’s not to like? It’s probably for the best that we are not in possession of a deep fat fryer. The combination of my desire to attempt to deep fry every chocolate bar known to mankind and my accident-proneness make the idea of owning such a device more than a little scary. Using oven chips makes this an even easier, but no less tasty, dish to prepare. In fact this is exactly what I am making for dinner tonight – my mouth is already watering! Oh, while watching the show the addition of the egg yolks was explained as adding richness to the dish and helping to slightly thicken the sauce. In fact the sauce is so good I guarantee you’ll be tempted to lick the plate! 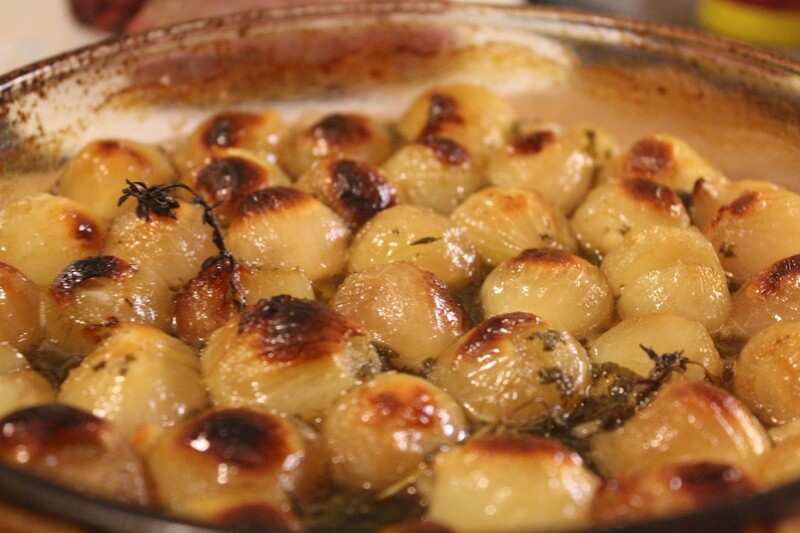 Roasted onions are the best! Whenever we have a roast dinner I always chuck a handful into the pan. I love it when they go all sticky, sweet and oozy. However I started wondering what rule had been set in place determining that these little gems could only be served with a roast dinner. I soon concluded that it was a nonsense and decided then and there that roast onions should be enjoyed whenever possible. Fortunately I am not alone in this belief. All I will say about this recipe on the GE Healthahead website is that we have enjoyed it on a weekly basis since discovering it. It is simply that good! 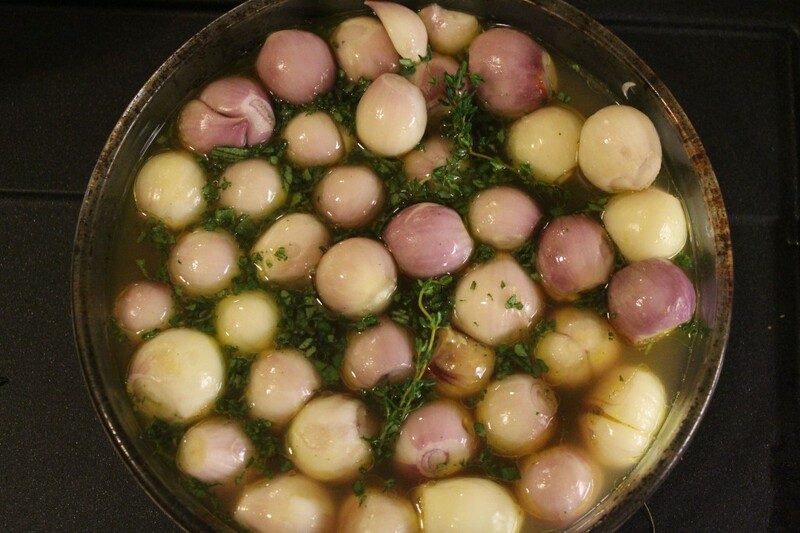 It is best to use smaller onions such as pickling, baby, pearl or shallots. These are delicious with roast meats, mashed potatoes, cheeses, in sandwiches and on their own. Seriously give these onions a try -they are amazing! Cut the root end and remove the papery outer layers from the onions, leaving them whole. Stir together remaining ingredients and pour over onions. Bake at 180°C, stirring occasionally, for 50 to 60 minutes or until onions can be easily pierced with a knife. This is a tough time of year. Here in the UK we have a tiresome combination of cold, dark, blustery and wet. Despite a real passion for cooking the seasonal blues take hold and drain my motivation, especially when it comes to midweek meals. This recipe from Rachel Ray via the Food Network provides the perfect solution. 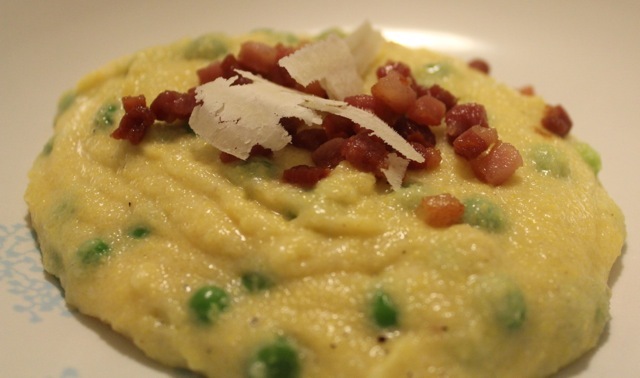 It’s easy to make, absolutely delicious and ticks all the comfort food boxes. As a one-pot meal it also saves on the washing up – BONUS! about my love of the Brussel sprout. for a veggie that tops the ranks. every mouthful a sheer delight. about the lovely Brussel sprout. As much as I would like to say I was a perfect child, I wasn’t. I was naughty, had tantrums and caused my parents all sorts of grief. However, I always ate my Brussel sprouts. That probably isn’t much of a consolation but that’s all I’ve got. For years I was content having sprouts boiled and served up with butter, salt and lots of pepper. Now I have discovered there are other ways to prepare these magical veggies. This particular dish has come my way via the GE Healthahead website which has a huge range of delicious and healthy recipes. I think even those who aren’t keen on Brussel sprouts will be converted once they give this a try! One new thing I have learned about Brussel sprouts is that they are also known as ‘Brussels sprouts‘. Apparently spelling them either way is fine – they still taste wonderful. I always knew my summer holidays were coming to a sad end when my grandparents began their laborious preparations for making chutneys, relishes, jams and pickles. The process always seemed so complicated with sterilizing jars, tongs, gloves, large pots of boiling water, copious amounts of paper towel, cling film, gauze and of course the occasional swear word. The end results were always fantastic but for many years I suffered from ‘preserve angst‘. This year we had a huge glut of tomatoes from the garden. Bored of using them in salads and pasta sauces I decided it was time to face my fears. Fortunately I found a simple tomato chutney recipe by Christina McCloskey courtesy of Jamie Magazine. It was so easy I didn’t even have to use tongs or swear words. Now that’s my kind of chutney! It is especially delicious with vintage cheddar and oat cakes. The other day my Aunt Ellen sent me photos of some beautiful strawberry tarts she had made. Just seeing pictures of them was enough to get my taste buds going. Sadly the distance between Kent and Toronto is too great and I was denied a taste. She mentioned having an abundance of leftover strawberries and was unsure as to what to do with them. Immediate thoughts turned to smoothies, ice cream and jam – but surely there are other ways to use strawberries? A quick search uncovered this recipe for Strawberry and Arugala Salad. I happened to have some spare strawberries so thought I’d give this salad a try myself. I wasn’t able to get a hold of prosciutto so used smoked, back bacon from the local butchers. For the salad leaves I opted for baby spinach, lamb’s lettuce and red chard with slivers of beetroot. It was amazing and definitely my kind of salad. The combination of sweet, juicy strawberries with salty bacon and creamy feta is to die for. This is the perfect summertime dish. Here is the original recipe with my changes in paranthesis. Whisk together first 5 ingredients (through to the black pepper) in a large serving bowl. Add berries and red onion; let stand 15 minutes. Meanwhile, lightly coat a seasoned cast-iron skillet or nonstick pan with cooking spray, and heat over moderately high heat. Add prosciutto in one layer, and cook, turning, about 5 minutes or until golden brown and crispy. Transfer to a plate to cool; crumble and reserve. Divide the salad among 4 serving plates, and top evenly with the cooked prosciutto.